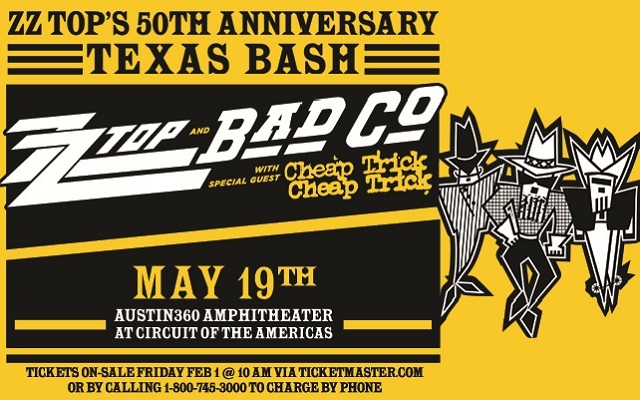 Rock and Roll Hall of Fame inductees ZZ Top are coming on strong with their 50th Anniversary Texas Bash celebrating a true career milestone with three key performance dates set for three “Texas towns” this May. The band’s 50th-anniversary celebration is set to commence May 17 in Dallas at Dos Equis Pavilion, followed by a performance on May 18 in Houston at Cynthia Woods Mitchell Pavilion in The Woodlands. On May 19 the Austin360 Amphitheater hosts the ongoing festivities. The shows feature performances with friends and fellow rock legends Bad Company and Cheap Trick. The Texas Bash concerts launch ZZ ’s anniversary tour that has them rocking across North America and onto their UK and European shows throughout 2019. ZZ Top still maintains the most consistently stable lineup in the history of rock music: Billy F Gibbons, Dusty Hill and Frank Beard. In 1969, following the demise of The Moving Sidewalks, Billy’s Houston psych-rock band, the singer/guitarist formed ZZ Top linking up with drummer Beard and bass-guitarist Hill, both from the Dallas-based band, The American Blues. Fifteen studio albums, 30 million record sales and 5 decades later, “That Little Ol’ Band From Texas” is still going strong, playing timeless hits like “La Grange,” “Legs,” “Sharp Dressed Man” and “Tush” to audiences the world over.